In ATL, attending meetings of the Near East Archaeological Society. Two of the eight sessions I attended today were on biblical Gezer. A great deal of archaeological work has been done here for the past several seasons, including the ancient tunnel/water system, with more yet scheduled. Now this is the account of the forced labor which King Solomon levied to build the house of the LORD, his own house, the Millo, the wall of Jerusalem, Hazor, Megiddo, and Gezer. 16 For Pharaoh king of Egypt had gone up and captured Gezer and burned it with fire, and killed the Canaanites who lived in the city, and had given it as a dowry to his daughter, Solomon’s wife. 17 So Solomon rebuilt Gezer and the lower Beth-horon 18 and Baalath and Tamar in the wilderness, in the land of Judah, 19 and all the storage cities which Solomon had, even the cities for his chariots and the cities for his horsemen, and all that it pleased Solomon to build in Jerusalem, in Lebanon, and in all the land under his rule. (1 Kings 9:15-19). 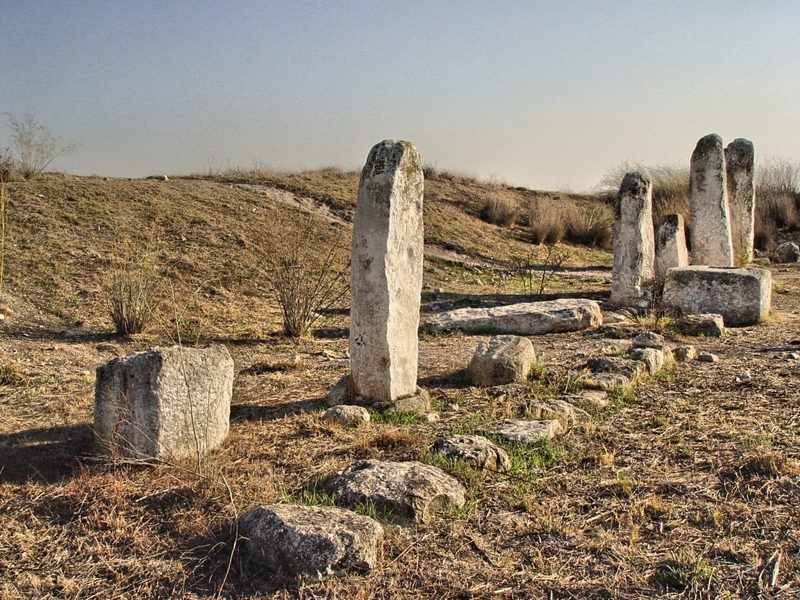 Our photo here shows the standing stones at the high place at Gezer. Standing Stones at Gezer. Photo by Leon Mauldin. Gezer guarded the entrance into the Shephelah region. It is located approximately thirty kilometers northwest of Jerusalem. Gezer was strategically situated at the junction of the Via Maris, the international coastal highway, and the highway connecting it with Jerusalem through the valley of Ajalon. I have several previous posts with photos & info here, here, here, here, and here. Hint: pronounce Gezer with “short” e, not GEEzer (def. : old man). This entry was posted on Tuesday, November 17th, 2015 at 8:01 PM and is filed under Archaeology, Bible History and Geography, Bible Study, Israel, Old Testament, photography, Travel. You can follow any responses to this entry through the RSS 2.0 feed. You can leave a response, or trackback from your own site. Thanks for your post, Leon. The Dec 2009 aerial photograph helps me figure how close I was. My wife and I went looking for the excavations last March. We made it to the kibbutz on the hill (top right of your Dec 2009 picture) We could never figure out an access road to the site from that direction Since we had a rental car and not a jeep, I didn’t take off on farm road and risk damaging the car. After driving around the kibbutz for about 45 minutes, we had to give up and drive to the airport where we were to meet our tour group. Wish I could have been there today for the NEAS presentations, but I committed to teaching a Bible class this quarter, so had to give up on the trip. Thanks again. Really appreciate your blog.